I got a teacher catalog in my mailbox full of fascinating educational materials to buy, and this was featured on the back cover. Yes, it was a totally serious catalog, complete with equally serious advertising for the hours of fun you will have with this doll. Luckily for you, you can get a free sample of the doll here, and there's even a John McCain. If you buy the set, you also get clothes and the rest of the Obama family. Fellow Americans, you can see Barack Obama (and his family) in his underwear. If that's not enough to get you to vote for him, I have nothing left to say. The other part of my post is in reference to a recipe on the Premium brand saltine crackers I bought today (for Amaya, who has diarrhea-- Joy). On the front of the box it says "Delicious Recipe on Back!" Lo and behold, a recipe for "Corny Macaroni and Cheese" graces the back of the box. This recipe is scrump diddlyumptious looking, especially knowing that 10 saltine crackers are mixed into this corny pasta masterpiece. I said to Jake, "Really? Do they really think that people buy this box of crackers for the delicious recipes?" 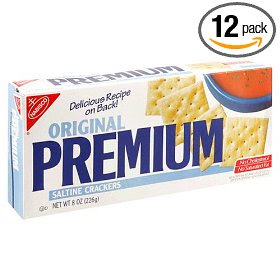 To myself I am thinking that the only reason people buy saltine crackers is if they have soup, diarrhea, a stupid camp relay wherein a person eats several saltine crackers and then attempts to whistle, or a baby in her uterus. This is not a recipe that appeals to this audience. In any case, the digester of saltine crackers is only thinking, "Why did I buy a whole box? I won't even like these after the first five, and I am so never eating saltines again." For years I truly thought that saltine crackers only existed in 2 cracker portions, wrapped in clear plastic, and available in salad bars. In these cases, saltine crackers taste wonderful, and are fit to steal. Jake said back to me, "You know that someday you are going to meet someone who bought saltines for the recipe on back, and it is going to be hard for you not to laugh at them." Ah. Too true. Does this make me a bad person? i do actually like saltines, but i have had only good experiences. and i really want that paper doll. I just signed up for the free samples. very excited to start my barack and michelle obama paper doll collection. Do they include the kids? How about the pregnant palin daughter? just had to talk G out of a costco sized box of saltines. she loves them, runs or not. I like saltine crackers but I never buy them. and yes, I do like them with soup. though i didn't buy the box for the recipe, zach's favorite soup ...or favorite soup that i make - is basically from a recipe that was on the back of the saltines box - i think i changed the herbs/spices and may have added broccoli, but the idea/foundation of the soup came from the saltines box. advertising methods constantly amuse me. those tiny little things that companies think will put them above the others. but sometimes it kind of bugs me that they always toot their own horn...like, "delicious recipe." um, I think I'll decide if it's delicious or not. oh, and the guys i work with definitely tried the saltine challenge one day, it was interesting to say the least. Thank you very much for your comments on our blog, it's really motivating to know that people actually read our writings. We would love to have you back. come back to school already you ditcher! I'll weigh in on the saltines question. I like them a lot. Of course, we had a relatively snack food deprived childhood (an inconsquential loss in comparison with everything else we got), but I still can't stand most flavored crackers, esp. cheese flavored. Not food, imho. What, you're saying that the reason saltines have survived as a food item is not on pregnancy alone? Well, I guess I was wrong about that. Sorry, Annie, if you are offended by my culinary critique. I'm sure the soup is good, and I am so glad you are blogstalking me. We miss you guys too!